Do koi fish bite? It is a question as old as koi are, which is over one hundred years, and the answer is simple - yes koi do bite. 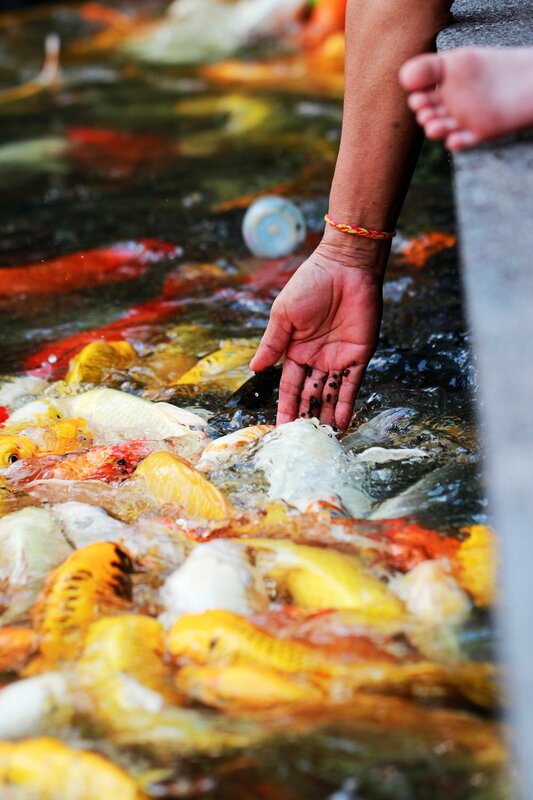 However don't let that scare you away from feeding your koi by hand or sticking your toes in the water. A koi fish bite will only tickle you, but their little nibbles help them eat food from the bottom of your pond and can be dangerous to other fish. If you have had koi fish for a while you have probably noticed some teeth in your pond, and it probably surprised you a bit! If you haven't found any yet keep an eye out because koi fish lose teeth regularly and they quickly grow back.A koi's teeth look a lot like a human molar, but don't worry about these molars meeting your hand next time you feed your koi! A koi's teeth are placed in the back of their throat and are used to crunch down on shells and insects it finds at the bottom of their pond, so while bugs may have to worry about a koi fish bite you don't have to. A koi's mouth may seem to be overly large for their heads, but that doesn't mean they are waiting to munch down on huge bits of food. A koi's bite is perfectly designed to be effective at the bottom of a pond, but also allows them to eat floating food. This makes them benthic feeders meaning they can eat at any water level, which is not very common. While you yourself do not need to fear a koi's bite there are times when koi fish bite other fish. During breeding the male koi fish will bite and bully the female, and these love bites can cause damage to the females fins or even cause her to lose scales. While breeding is the only time koi fish are aggressive toward other koi - smaller fish definitely need to fear a koi fish's bite. Gold fish are common victims of koi fish aggression with some koi going as far as to eat parts of their pond mates. Here is an amazing informative article called Aggression of Koi Experiment which evaluates koi fish aggression towards fancy gold fish if you would like to know more. Really a koi fish's bite is more impressive than many people believe it to be! Not only does the teeth in the back of their throats allow koi to eat just about anything, but the positioning of their mouths lets them eat anywhere in the pond. Even more impressive is the fact that even without frontal teeth a koi fish's bite can actually do quite a bit of damage to other fish. Were you as surprised by a koi fish's aggression as we were when we found out? Have you found any teeth in your pond or caught your koi harassing one of it's pond mates? Share your stories with us down below, we love to read them!